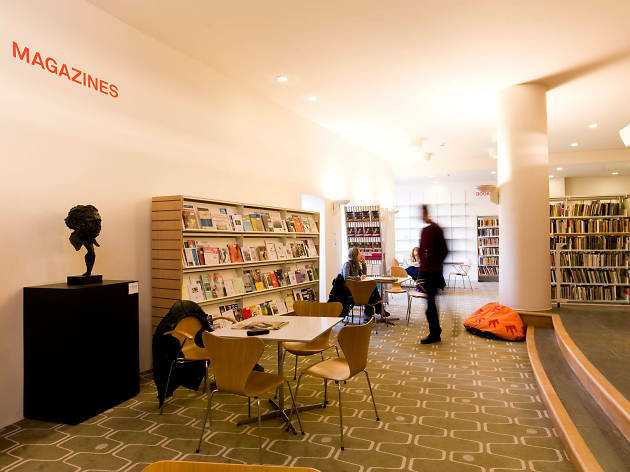 Have you visited these incredible London libraries? Worldwide icon-chevron-right Europe icon-chevron-right United Kingdom icon-chevron-right England icon-chevron-right London icon-chevron-right Have you visited these incredible London libraries? A vault of verse sits on the fifth floor of the Royal Festival Hall. It’s a library collection that goes back to the birth of modern poetry in 1912, the year Poetry magazine made its debut with Ezra Pound in its pages and Harriet Monroe as the editor. But this isn’t just a historical archive, you’ll find Kate Tempest a short walk from Byron and Allen Ginsberg here. It’s a space for workshops, exhibitions, spoken-word shows and for reading solo, cross-legged on the carpet. The National Poetry Library. Waterloo. Tue-Sun. Free to join. When this Tottenham library was at risk of closure in 2015, residents brought it back from the brink with a fierce public campaign, and it ended up getting a £3 million refurb instead. With it came 22,000 new books, including a strong selection dedicated to Jamaican national hero Garvey and other Afro-Caribbean writers. It’s also next to a well-equipped gym and leisure centre. The path to self-improvement never ends… Marcus Garvey Centre. Seven Sisters. Mon-Sun. Free to local residents. Sit down to play the piano for free, borrow orchestral sets and scores and remind yourself what CDs looked like at this safe space for musicians and the people who love them. The staff have a ‘High Fidelity’-level knowledge of most music genres, without the pretension, and you can pretty much spend the day flooding your ear canals with new sounds in the listening booth. They’ll even stock the work of new unknown London artists on request, so the public can discover and borrow their music. Isn’t that lovely? Barbican Music Library. Barbican. Mon-Sat. Free membership to those who live, study or work in the City of London, and to regular Barbican visitors. Get active, get organised and get angry with the help of the huge archive collection of Women’s Liberation Movement literature at this small space near Waterloo. Leaf through copies of radical 1970s mag Spare Rib and the Black Feminist Newsletter. It’s a place to wake up to the fact that feminism doesn’t begin and end with the latest Guardian thinkpiece. Aside from the reading material, the library hosts regular activist events. Up next: the Latinx Feminist Festival, a celebration of the Latin American community in London with workshops in Spanish, Portuguese and English exploring Latinx culture (until November 4). The Feminist Library. Lambeth North. Tue-Sat. Free entry. Think phone boxes and libraries are a thing of the pre-digital past? You thought wrong, because here they are, joining forces to create an analogue supergroup. At this Lewisham deposit of paperbacks, there is no librarian to rubber-stamp your copy of ‘His Dark Materials’. Just squeeze your way in, take a book to read and (ideally) replace it with one of your own. Loampit Hill on the corner of Tyrwhitt Road. Lewisham DLR. Open 24 hours a day, seven days a week. Free. More places to borrow books? Check out our pick of London’s most beautiful libraries. Or how about the best bookshops in London for longer literary love affairs.